By now you’ve heard me rave on and on about Caroline Constas on probably four or five separate occasions. 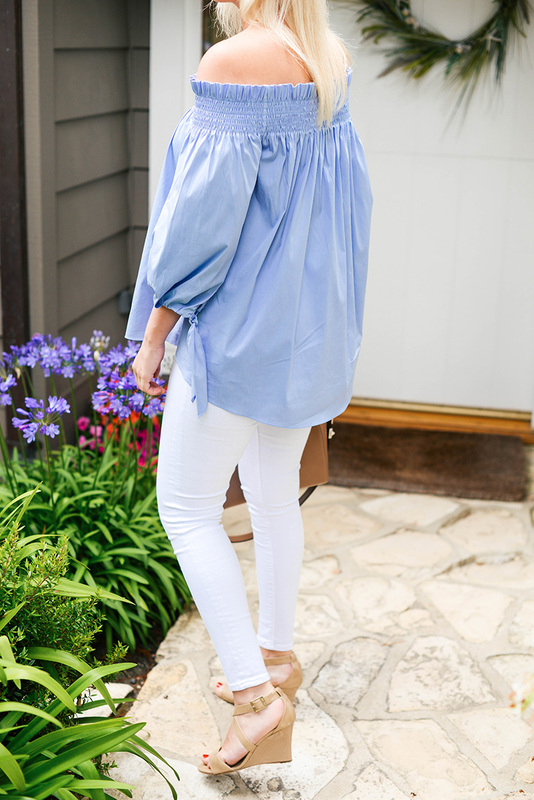 And it’s not like I was talking about different pieces… I have an obsession with this one off-the-shoulder top! I now own it in white, black + white stripes, and finally this French blue hue. I seriously wear these tops more than anything else in my closet during summer. They are perfect for brunch with shorts and sandals, or dress it up with your favorite white jeans and heels for date night or girl’s night out! 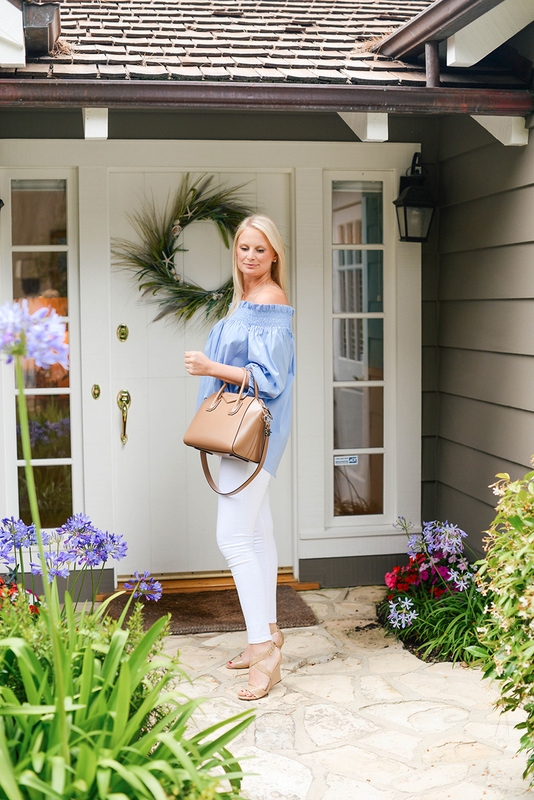 This Caroline Constas Lou off-the-shoulder top is universally flattering and comes in a wide range of colors and print options now (hallelujah!). My favorites right now are the white and the blue + white stripes. So summer perfect! Some of you might see it as an investment, but it’s the best one I’ve made all year – I have gotten SO much use out of each top! If you can only afford to get one of them, I would highly recommend buying the white top. I’ve worn it with all white, regular blue denim, black denim, tucked into a variety of skirts, etc. It’s very versatile and elevates every ensemble. If you’re looking to pad your fall wardrobe with some chic essentials, try it in black! PS – there’s also a new off-the-shoulder style by Constas featuring a swiss dot print. I NEED IT! So dainty and fresh. this top is so pretty, I see why you like it so much. That top is just perfect! The color and OTS, I love it! You wear OTS like no other! I swear, when I see these tops on you…they feel absolutely timeless and it makes me want to go buy several. So classy, Merritt! Always. Love this look on you so much! Perfect details! Can’t get enough of off the shoulder tops! That color is beautiful! This Top is really nice and the other colors are undoubtedly gorgeous as well! Love this look. I’ve been living in off the shoulder tops lately. Love those wedges too. These photos are so pretty! I love that top and that blue color looks so pretty on you! This off the shoulder top is so pretty, love the details at the sleeves! Beautiful look!